Situated on 2.5 acres of land a beautiful 2500 sq ft bungalow with adjoining garage. 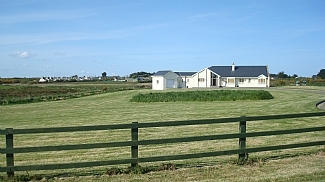 Located in a rural setting yet less than 5 mins drive from Rosslare Strand/shops garage/ restaurants and 10 minutes from Wexford town by car. The property consists of 5 double bedrooms, two with en-suites. There are two sitting room, a kitchen/dinning/sun room with a large utility room and very large deck to the rear. Change over day is Saturday in July and August - other months we are flexible on dates and times. Towels and linen are included. The property will be cleaned before you occupancy. a full size bath and a separate shower cubicle with electric power shower. with large sofa, satellite TV and a multi-fuel stove for that cosy evening. The kitchen is a large room incorporating a dining room (including table and chairs) and a sun room with a large rattan sofa and arm chair.